OverviewFriends, neighbors and things to do in Rappahannock CountyMagnolia Vineyards & Winery Write-ups! 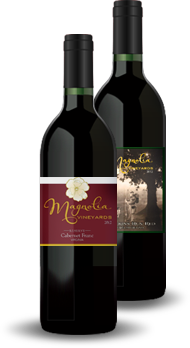 Magnolia Vineyards & Winery tasting room is currently open Fri through Sun 11:30 - 5:30. We welcome all visitors, including children under adult supervision. We allow well behaved pets on leash outside of the tasting room. We have begun construction of the new separate tasting room/winery facilities (expected to open in Spring/Summer 2019) and that structure will be handicap accessible/ADA compliant. Individual tastings are offered at $10 per person and include a keepsake glass. A tasting fee will be waived for each 2 bottle wine purchase in the same visit. Please note that a tasting typically includes 6-8 wines, but the number of wines may change by availablity and limited time special offerings. All individuals participating in a tasting, or purchasing glasses or bottles of wine for either onsite or off, must be 21 years of age and have a valid ID available upon request. We apologize, but due to the limited size of our facilities and staff we have to plan our scheduling and events carefully. (at least 72 hours in advance). Group tasting fees are $15 per person and will include a keepsake glass upon request. Group tasting fees do not qualify for the 2 bottle purchase waiver. Visitors are welcome to picnic on the grounds. We have tables near the tasting room or encourage a walk up to the Black Walnut tree with its view of the Blue Ridge mountains and vast area for laying out blankets. We offer a modest selection of light fare available for purchase. Outside food is currently permitted in all seating areas both indoors and out. We only ask that guests clean up behind themselves so that others may immediately enjoy the same area. Please be aware that Virginia law strictly forbids outside (non-Magnolia Vineyards) alcoholic beverages regardless of age of guest or container type. As this is outside of our purview, any guests bringing or consuming outside alcohol onto our premises will be asked to depart immediately. Additionally, it is a violation of Virginia law for us to further serve or sell our wine to anyone that is obviously intoxicated. We are a family run establishment and ask all of our guests to enjoy our products responsibly and to be receptive to any limitations our staff imposes.